Hiya guys! Today is the best day I have ever had in my life. My amazing hubs surprised me with tickets for the upcoming BTS concert in Newark NJ. I have spent most of the day screaming and crying hysterical, both from excitement and over the price tag for the tickets haha. But it isn't just an exciting day for me, but for all of you as well. It's finally Polish Pick Up day! And for today I'm sharing swatches for Wakka Wakka by Sassy Pants Polish, which is the June contribution to the Polish Pickup Collaboration. Can you guess the video game by the name?! I hope you can because this one is really special to me... without further ado let's head on over to the swatches! Wakka Wakka by Sassy Pants Polish will be available for purchase through the Polish Pickup Shop Friday, June 1st at 11AM EST through June 4th. The full-size 15mL shade will retail for $11 each and there is no cap this month. If you're not familiar with the concept, the Polish Pickup offers a fun, interactive experience that allows you to submit theme ideas, vote for your favorite theme, and selectively purchase your favorite polishes every month. As I mentioned before, the theme that was voted for June is Video Games. This month Angie found her inspiration from one of her favorite video games played on the Atari and the arcade, Ms. Pac Man. Wakka Wakka can be described as a violet purple jelly base with violet and magenta and yellow micro flakies and magenta and violet holo shreads with holo and a blue-violet iridescent shimmer. My little heart can barely control the excitement over this shade! Ms. Pac Man always holds a special place in my mind as it was one of the first video games I ever played with my dad. So it definitely pulls me in for nostalgic reasons, but that's not all since it also happens to be stunning. The different colored flakes are so cute and add such a unique pop factor. The hue is also super bright and fun for the upcoming summer months! The formula has a good opacity that builds-up nicely for full and complete coverage. Consistency wise it's well balanced, not too thick or too thin. It's pretty easy to work with and layer with the glitters spreading evenly throughout the application. It dries down to a minimal gritty finish that smooths out perfectly after topcoat. The combination of the flakes and shimmer make it seem more textured in photographs than it actually is. I also experienced no staining on removal to either my cuticles or my nail beds. Shown here in two coats and sealed with a glossy topcoat. 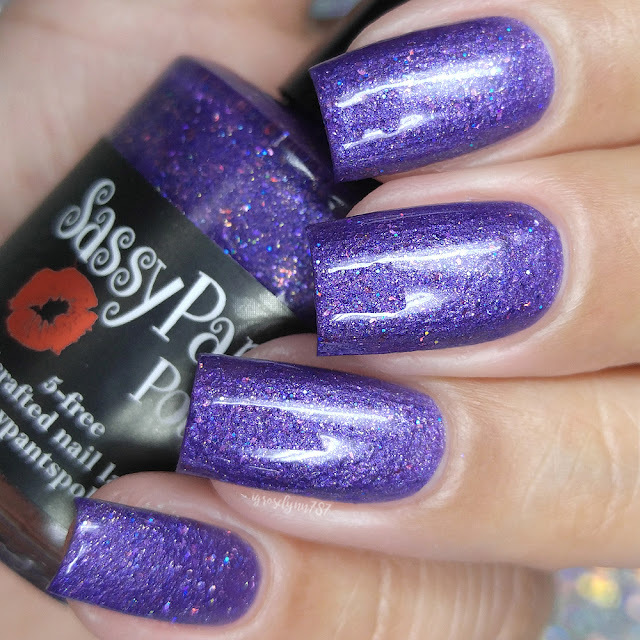 To recap, Wakka Wakka by Sassy Pants Polish will be available for purchase through the Polish Pickup Shop Friday, June 1st at 11AM EST through June 4th. The full-size 15mL shade will retail for $11 each and there is no cap this month.